On April 4, 2015, Walter Scott of South Carolina was stopped by a North Charleston police officer for a burned out blinker on his car. It was Saturday morning. Scott had no prior criminal history and was unarmed. At some point Scott exited his vehicle and according to the police officer Scott reached for the officer’s Taser. The officer drew his weapon and fired multiple shots, killing Walter Scott. The officer said he feared for his life and was justified in using deadly force. That’s the way things stood until three days later when a video tape by an anonymous witness surfaced at the New York Times and other media outlets. The video clearly shows Scott running away and the officer calmly taking aim and firing multiple shots into Scott’s back. The officer then handcuffed Scott, ran back to where the office had fired his gun, picked up an object and then dropped it beside Scott’s body. The video was turned over to investigators and Officer Michael Thomas Slager was charged with first-degree murder for the shooting death of Walter Scott. Michael Slager is white. Walter Scott is black. This is a nightmare story that is all too common. is pending and will be published here when completed. But there are a few quick facts off the top that you should know. 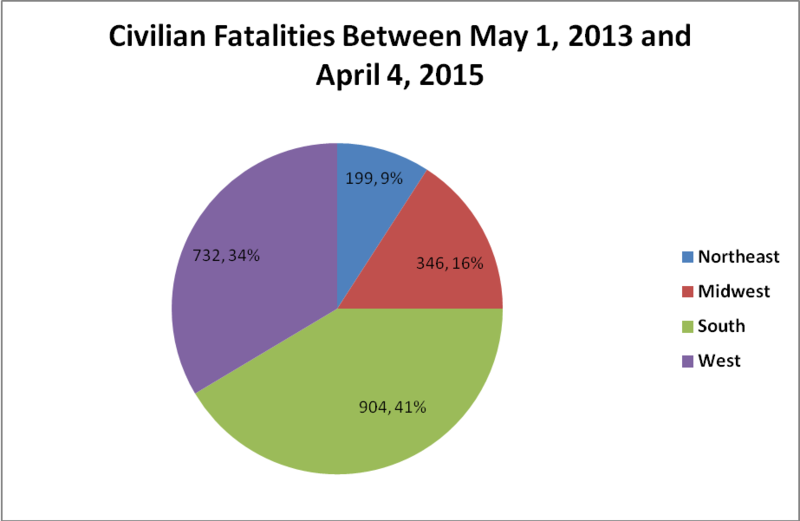 In 23 months news accounts reported 2,178 civilian fatality incidents at the hands of the police. That means there are about 94 per month or around 3 police homicides per day. Fatalities are almost entirely men, 2,044, with only 135 woman killed and 6 whose gender was undisclosed. The identities of 565 victims were undisclosed to the media. The average age of the known fatality victims is 36.9 years. 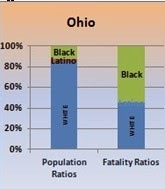 Latino’s make up 18.7% of the general population and were 17% of the fatality victims during the past 23 months. 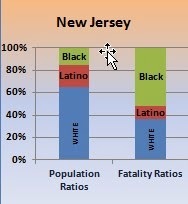 Whites make up 77% of the population but only 48.1% of the victims. 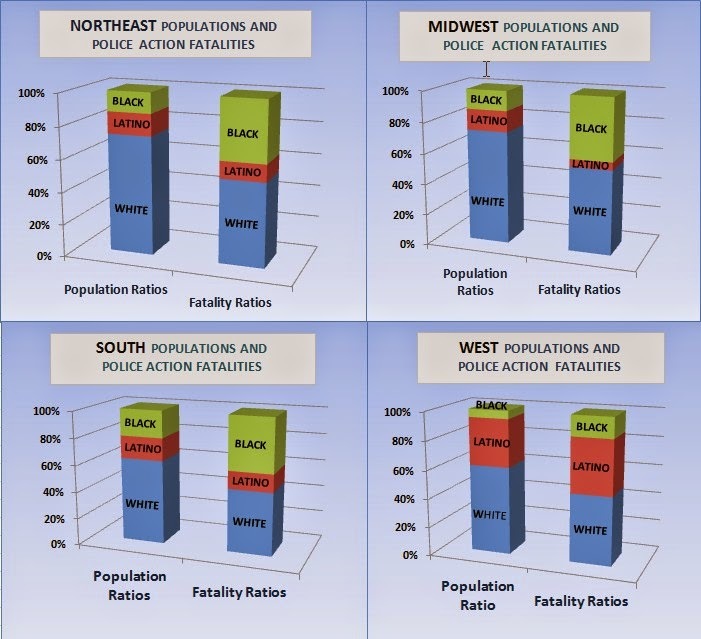 African-Americans make up just 13.2% of the general population but 492 of the victims of police related fatalities, or 30.5% of the total. If there is a perception in the Black community that they are disproportionally targeted by police, these facts only confirm their fears. The vast majority of law enforcement officers are good, law abiding men and woman who put themselves on the line to protect us. So, it may seem impossible that any officers could wantonly direct deadly force towards otherwise law abiding citizens of color without legal justification. The Scott video is graphic evidence that it does happen. You can see for yourself here, but a warning: video is disturbing. A full and fair discussion of racism, the law and the American Justice system is overdue. The urgency is now. People are dying. What does it really mean when we say, “that person is very powerful.” Or what is it about an organization or corporation that makes us think of it as being powerful. The word “power” has clear meaning when we are talking about a car motor, or water crashing down a cliff side. Yet when we apply the word to people or organizations it is more difficult to pin point just what we mean. The power we are speaking of is social power, and why a person has it and how it operates often seems mysterious. My purpose here is to describe in brief my understanding of social power, what it is and how it operates. I have read books and articles on the subject but have not been very satisfied. I found the language of these works to be somewhat inaccessible or ambiguous. Also, the focus is often too narrow for such a broad topic. I have no special credentials to bring to this task beyond a lifetime of observation as a social worker in the fields of mental health and child welfare. I consider myself privileged to have observe people on many different levels from the intimacy of their homes to the halls of government power. This discussion, then, is intended more as a personal reflection than a scholarly pursuit and a hopeful effort to raise a productive discourse on this topic. While each of us understands social power and responds to it in our daily lives, it remains difficult to define. This is partially because it is so pervasive and takes so many forms. It operates on every level of human interactions from the intimate to the geopolitical. For social beings, social power is our atmosphere. It surrounds us like an ocean, is essential for our survival and yet as invisible and ever changing as the wind. Social power is often expressed in symbols. We all recognize obvious symbols of social power, like an American flag or a corporate logos. We bestow social power on our politicians when we elect them to govern. We ascribe power to people who attain “powerful position” in their company or organization. There are also very clear status symbols of power, such as a police uniform, or a Gucci handbags or the Armani suits worn by successful business people. We recognize social power when we see the skyline of great cities or the grandeur of beautiful cathedrals and synagogues. Social power is often very evident in religion. It is seen in religious symbols of worship. The special attire of priests, ministers or rabbis confer a measure of social power in the form of respect or prestige. The ornate garments of the Catholic pope during a high mass still invoke the power of ancient Roman. But the absence of power is just as evident. We see it in the beggar or the homeless woman on the street. We sense the absence of power in the ghettos or in the desolation of small, redundant rural towns in far flung places. We sense it in young children or in the elderly living out their lives in a nursing home. We even sense it in our pets. We all recognize and respond to social power every day. We know there is a certain pecking order in our families, among our friends or among our colleagues at work. We often exercise or respond to social power without giving it much thought. We acquiesce to authority figures such as a parent, a teacher, a rabbi, a boss or a judge. We often accede to the requests of a trusted friend or a loved one and expect the same in return. Conversely, we are very aware of social power when it is imposed on us or we are imposing it on others. Aware of it or not, in big ways and small, we are constantly exercising or responding to social power. How we experience it goes by many names; respect, duty, obligation, intimidation, pressure, fear, expectation, demand, request. We also experience our own social power as internal feelings. We might feel empowered, entitled, privileged, respected, or even feared. On the other hand, we feel weak, vulnerable, shamed or disempowered when we are ignored, rebuked, humiliated or abused. Suffice it to say, we are a massively social species. We have evolved keen social instincts and most of us develop significant social skills throughout our lifetime. In future installments I will define social power and trace its many forms over the spectrum of human activity. At every stage, after each post, I hope that you, the reader, will provide your reactions, insights and ideas to help improve this project. No contribution is too small or too grand, so please take the time to comment and share your thoughts and ideas. Thank you.